The halls of our house are all decked out for Christmas, including our 12 foot Christmas tree. Yes we could get a smaller tree, but that isn’t the way the DeNikes do the Holidays. Plus we need a big tree to show off the ornaments that we have collected over the years, starting with the ones I was given as a child. I have started collections for the boys, so they will have fun ornaments to remember years from now. Each year they get a new one from us and many years receive ornaments from others. As we were decorating our tree, one of my favorite ornaments dropped and broke (Jim has tried to fix, but I am afraid to put it on the tree). I started thinking about my favorite ornaments, who gave them to us, when we got them, etc. So here is my list. 1. 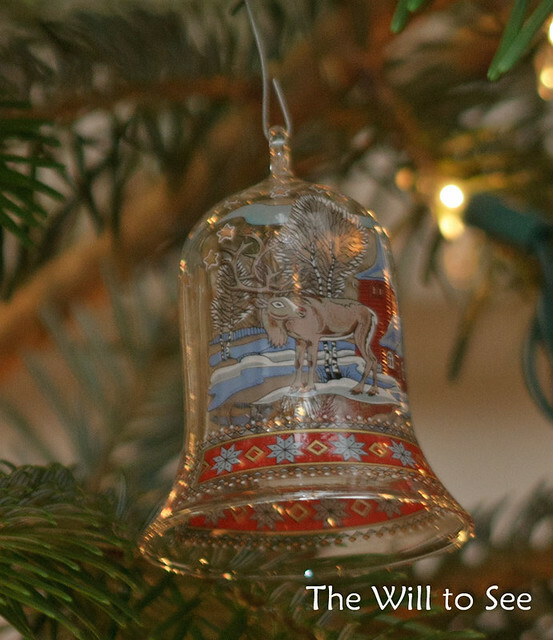 Glass Bell – My Mom brought this back for me from Germany when she went to the Christmas markets in 2004. 2. 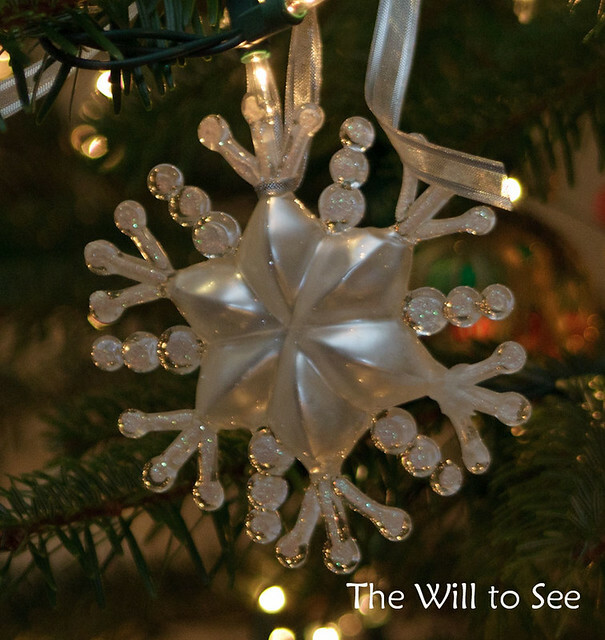 Snowflake – My friend Dana gave me this a couple years ago. This is the one I dropped. 3. Mickey Ball – We brought this home from our trip last week. I will always think about the great trip we had when I see it. 4. 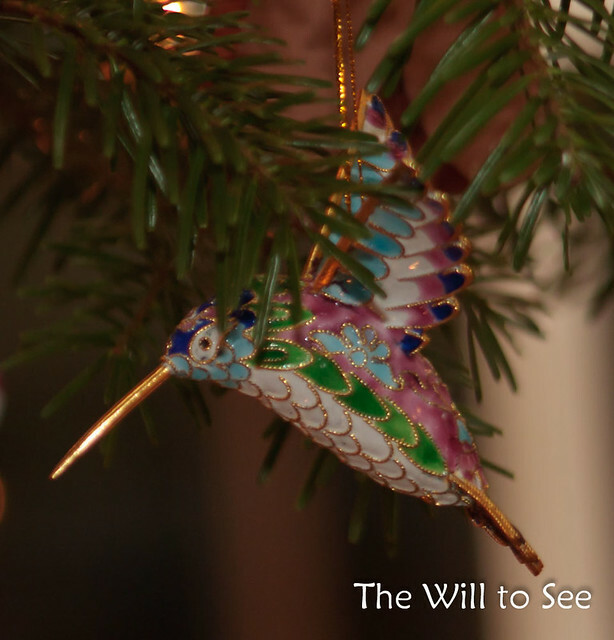 Hummingbird – I inherited this one when my Granny passed away two years ago. I will always think of her when I see it. 5. 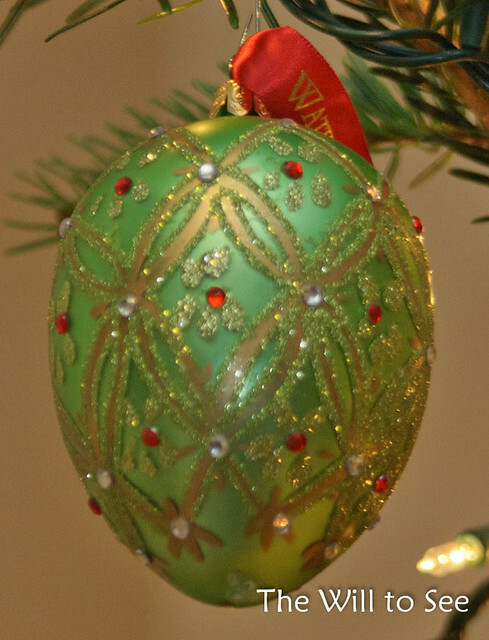 Waterford Egg – My aunt Denise gave this to Jim and me the first Christmas we were married. It makes me think of a Faberge egg. 6. 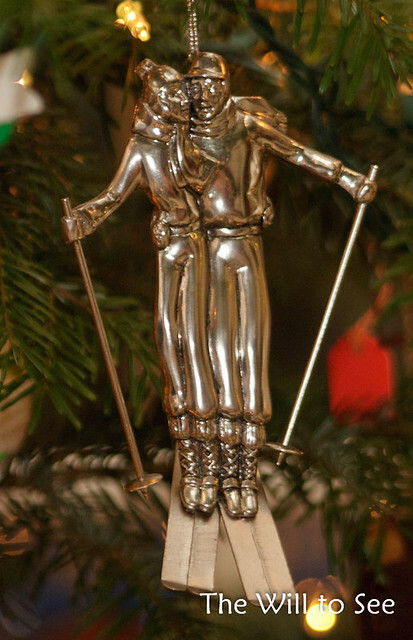 Skiers – Family friends, the Bishofbergers, gave this one to Jim and me when we were newly-married. I love how they are skiing together. 7. 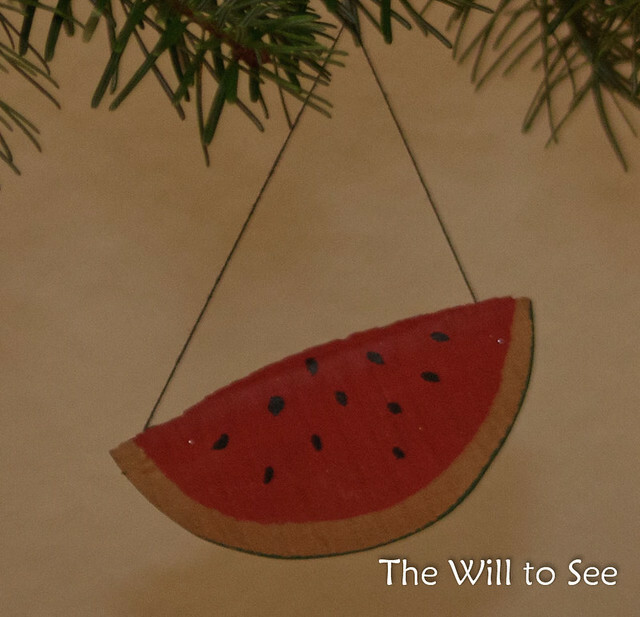 Watermelon – My Grandpa Harold grew watermelons and one Christmas all of the grandkids were given watermelon ornaments. This one hung on my parent’s tree until we got our own where it is displayed prominently. 8. 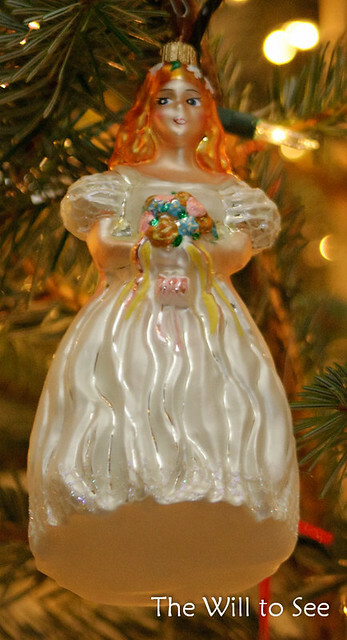 Bride – My Mom gave this to me the year we got married. She has a groom that hangs near her. 9. 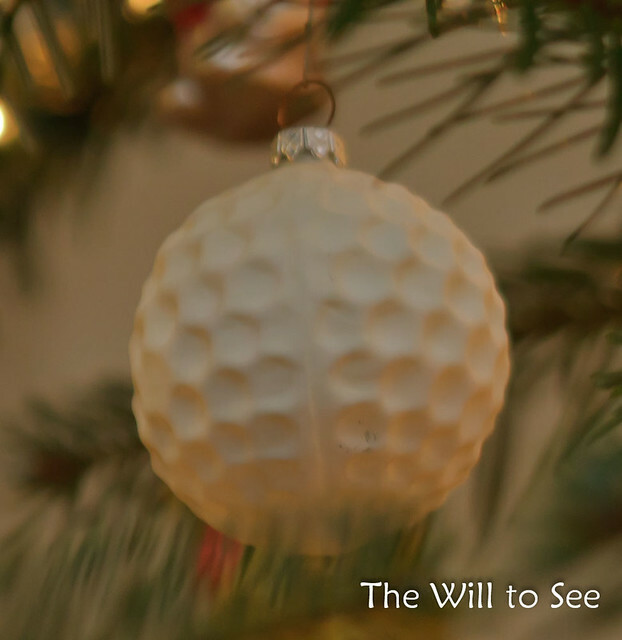 Golf Balls – My Mom gave us hand blown golf ball ornaments for our first Christmas together. We always get comments on them. 10. 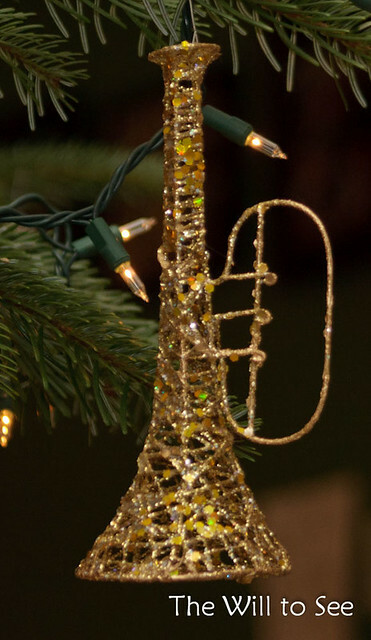 Trumpet –It reminds me of Jim since he used to play the trumpet. I am linking up with Monday Listicles at Northwest Mommy, even though I am not completely following this week’s theme and Mama Kat’s Writers Workshop. These are beautiful and tell such stories. Love how eclectic your tree is. Must have a lot of ornaments!! They’re beautiful! I love that you have treasured ornaments filled with memories, as opposed to just generic ones. Great list! These are lovely. I have all my breakable packed away this year so, my three year old can go near the tree. I love looking at ornaments and yours are beautiful! I love the Mickey ornament! 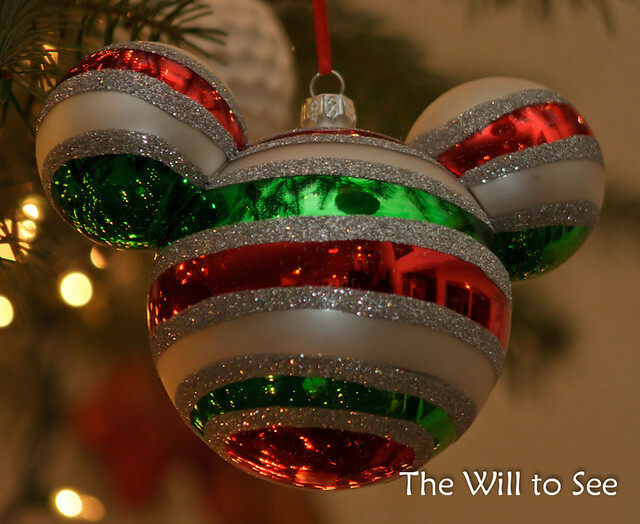 We are going to Disney World next week… I’ll have to pick up an ornament for our tree! I wish I had thought to buy one when we went last year. I love special ornaments. That first one from Germany is great. The hummingbird is beautiful. I love that you know/remember the story of each. I wish I had that with more than the few Disney ornaments from my childhood (and even those don’t have a “story”, just the memory of once being on the tree).